Put on Your Autumn Sweater! Time for that Autumn Sweater! Come September it's common to find invitations featuring warm reds and browns but sometimes it's more fun to push further into the concept. Seasonal invitation designs can be approached in so many more ways! Autumn Sweater- (Seasonal Wedding Invitation Design) - is very subtle but we snuck a few season-appropriate ideas into the final concept. We often print others design work but every now and then we're given the opportunity to really let our design skills shine. This custom designed invitation was a labor of love and we had the pleasure of adding a few fancy print features to the concept as well. 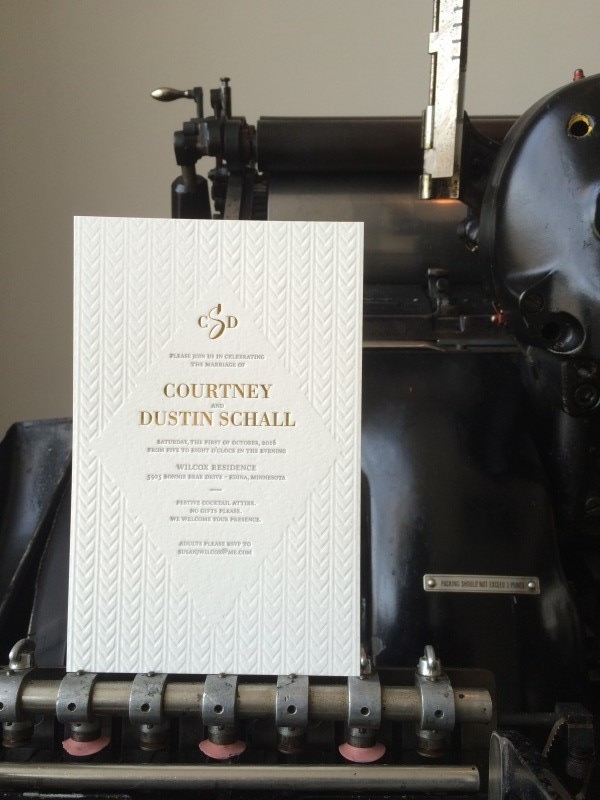 We included a touch of foil along with both letterpress printing and a blind impression. The pattern in the back is similar to a knit sweater texture which naturally lent itself to the diamond-shaped center area. Once we had these elements flowing it was just a matter of selecting the right fonts! The gold foil was an elegant exchange for the usual brown colors and the silver ink spoke more directly to our cozy Minnesota trees blowing in the fall breeze. The wedding was last week and it sounds like everyone was pretty pleased (as were we). Check out more of our designs here! Alex and Mark just had a baby. You know what that means... Announcements! Mark whipped up his own custom baby announcement design and forwarded over for us to turn out. I don't know the details of Marks design background but what can we say, he's got skillz. We always enjoy customer supplied artwork. Especially when it is so totally and completely cute. The announcements (pictured below) were printed on Crane Lettra Pearl paper with silver ink. Feast your eyes!